PATAPOUF the puppy is lucky to be alive after nearly becoming a carpet python's breakfast over the weekend. 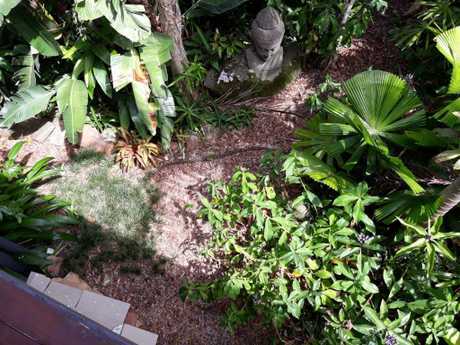 The 2-month-old golden retriever puppy was poking around in the garden of his Sunshine Coast home about 8.30am Saturday when his family suddenly heard him barking in a strange way. Shamin Cogez, 41, said she and her husband, Frederic, were upstairs in the two-storey home when they looked outside and saw "something wrapped twice around the dog's neck." "Everybody was still waking up slowly and suddenly we heard screaming, he was making a strange noise," she said. "Then we saw something wrapped around him and my kids got hysterical." Mr Cogez, 42, grabbed a broom and started hitting the 2.5m snake and trying to pry the puppy from its grasp, while Mrs Cogez called for help.
" I saw the back of the dog and something wrapped twice around him and thought 'Oh my God, my dog is dead'," she said. "I dialled triple-0 and told them the dog was being attacked by a snake and I didn't know what to do." 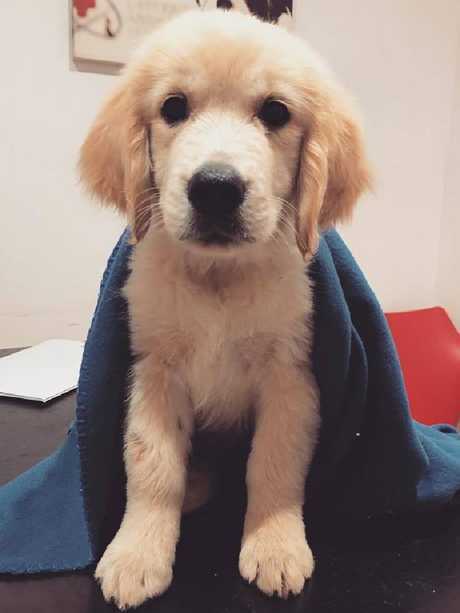 Patapouf the Golden Retriever puppy, pictured here at the Noosa District Animal Hospital after his ordeal, is lucky to be alive after nearly being eaten by a carpet python for breakfast over the weekend. Photo: The Cogez family. Patapouf the Golden Retriever puppy is lucky to be alive after nearly being eaten by a carpet python for breakfast on Saturday. The 2-month-old was taken to the Noosa District Animal Hospital for treatment, along with his brother, Tigrou the 3-month-old kitten, who went along for support. Photo: The Cogez family. The python, which had bitten Patapouf on the leg, eventually gave up thanks to the broom attack, released the dog and slithered away under the deck. Mr Cogez took Patapouf to the Noosa District Animal Hospital for treatment where he was cleaned up and put on antibiotics. 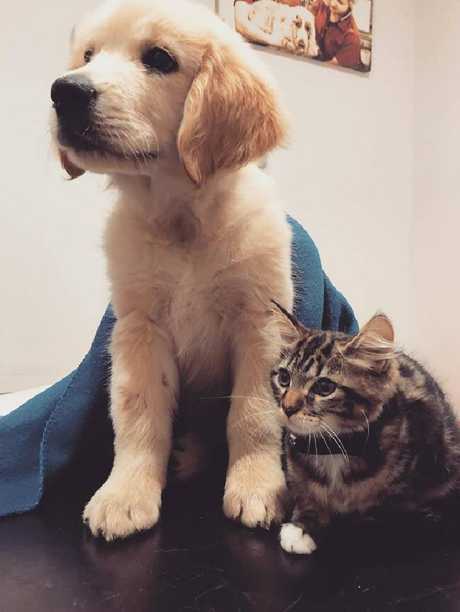 The dog's best mate, Tigrou the 3-month-old kitten, went to the vet with him for support. It is believed the kitten was inside the house at the time of the snake attack. Mrs Cogez said the couple and their children Adam, 13, Rize, 12 and Aaron, 6, had only recently to Marcus Beach from Clayfield in Brisbane and had never seen a wild snake before. "We just moved from the city to Marcus Beach about six weeks so this was a big shock to everyone," she said. She said their youngest son had been a bit afraid of the puppy prior to almost losing him to the snake. 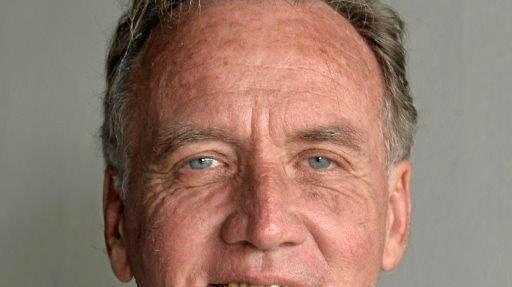 "Now he's thought 'oh my poor doggy' and he has forgotten that he was scared of the dog," she said. The carpet python that tried to eat a golden retriever puppy for breakfast on the Sunshine Coast on Saturday. Photo: The Cogez family. The family's new home is near a nature reserve, but Mrs Cogez said they've now cleared their garden in the hope of preventing more snakes from visiting. She said she was grateful the triple-0 operators helped her by finding the number to a local snake catcher. 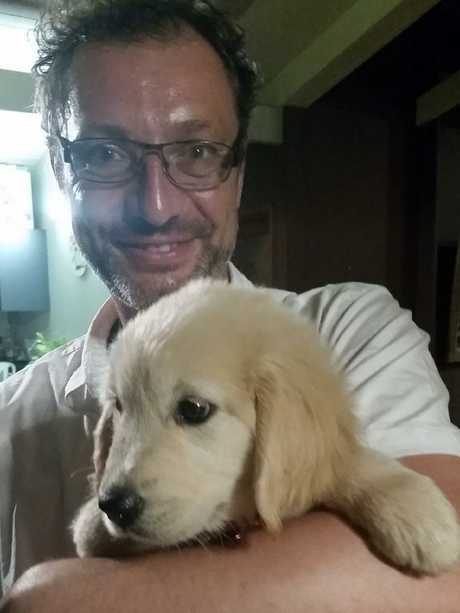 Mr Cogez said Patapouf - which means big or clumsy in French - has since enjoyed "millions of cuddles" since Saturday and hopes the puppy has learnt his lesson. "Thanks a million to the staff of Noosa District (Animal) hospital for the reactivity and the good care they have provided to Patapouf and Tigrou, his best mate," he wrote on the vet's Facebook page. Patapouf the Golden Retriever puppy is lucky to be alive after nearly being eaten by a carpet python for breakfast over the weekend. 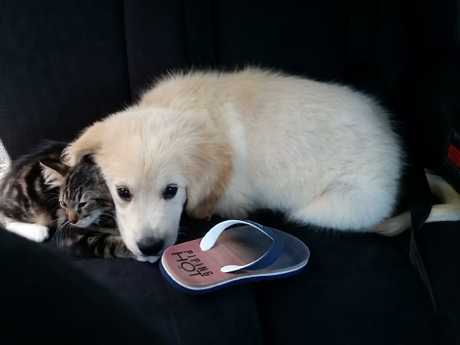 His best mate, Tigrou the 3-month-old kitten, went with him for support. Photo: The Cogez family. Patapouf is the latest among a number of cats, chickens, guinea pigs, birds and some dogs to have been targeted by pythons during this snake season. While cats have been devoured by pythons throughout Queensland since January, a Jack Russell puppy was recently saved from a snake in Brisbane and Reuben the cat was wrangled from the jaws of a python by his owner near Kuranda in November. Snake catchers told the Courier Mail that population growth was one of the reasons more cats and dogs were falling prey to pythons. Pets also had a daily common routine, making it easier for pythons to learn their routines in order to ambush them. Jonathan Hill from Miss Hiss Reptiles said the best way to keep pets safe from snakes was to keep them inside or in cat runs with wire that only had very small gaps.